Thank you Pierre! Lascaux painted Aurochs, a spotted horse, and Megaloceros giganteus on the cancel. Issued: April 13 1968.
Who is this FDC maker? PJ marqui? Thank you Pierre! 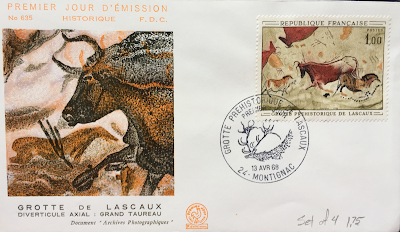 Lascaux II (or the replica cave) on a pret a poster envelope. Thank you Milos! S/a stamp released for the 75th anniversary of the cave discovery. Issued: September 10 2015.